There are ongoing continuing trends of the web browsers market share over the last year- Internet Explorer is declining, Google Chrome is rising and Firefox is (more or less) holding still. These “regular” movements made me thinking- How the web browsers trending can affect the search engine market share? To investigate this issue, i decided to use the most accessible data i have in my reach- My own website’s stats from Google Analytics (of the last 3 months). First of all, i will examine how the web browsers share are reflecting in my site’s stats and afterwards i will dig deeper to the web browser share of each of the major search engines (Google, Bing and Yahoo). Unlike the general web browser market share trend worldwide, mine is a little different- IE is still first (29.86%), however Firefox is very close behind (29.63%), where Chrome is also in the picture very near (23.71%) and Safari has a decent 9.62% share. In my opinion, the reason for the difference is that my website attracts more internet savvy’s that use much more Firefox and Chrome than IE. The most popular browser of Google incoming traffic is Firefox (28.69%) where Chrome is second not very far behind (28.24%). 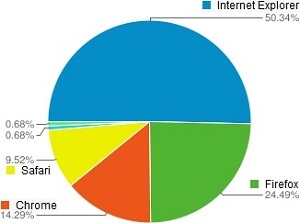 IE is falling to the third place with only 25.51%, lesser than its overall average share. Safari also has a respectable present of 10.93%. 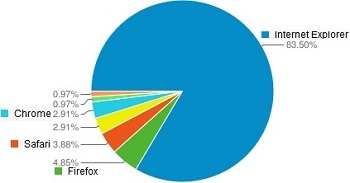 Bing’s browser stats amazed me- IE dominates it completely (83.5%) where only share fractures left for other browsers like Firefox (4.85%), Safari (3.88%) and Chrome (2.91%). 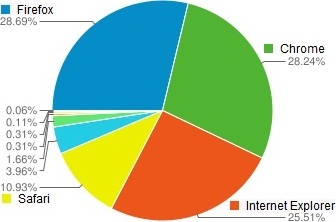 IE has a big hold (50.34%) in Yahoo stats as well where about quarter of the traffic comes from Firefox (24.49%). 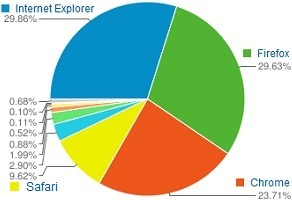 Chrome has lesser than its overall browser share (14.29%) while Safari is surprising again with 9.52%. It seems that the browser’s default search engine has a big impact- The slow gradual decline of IE over the last years is damaging first and foremost Bing as it relies greatly on users that use this browser and also on Yahoo as it responsible for half of its referral traffic. The main search beneficiary of Chrome’s rising is (not surprisingly) Google as its the default search engine of the browser. It is also worth mentioning Safari (Of Apple) that holds nearly 10% of the browser share and reflects the increase of the mobile industry (Safari is the default browser in iPhone and iPad).